Members of the OSU Synchronized Swimming team compete during the Jessica Beck Memorial Competition Feb. 1 at McCorkle Aquatic Pavilion. The team finished 1st. Routines based on the elements of fire and ice solidified the Ohio State synchronized swimming team as national champions. An overall score of 57 points secured a first-place finish for the Buckeyes at the 2014 U.S. National Championship Saturday in Oro Valley, Ariz., making for the team’s first U.S. Senior National title since the 2010-11 season, according to an OSU press release. 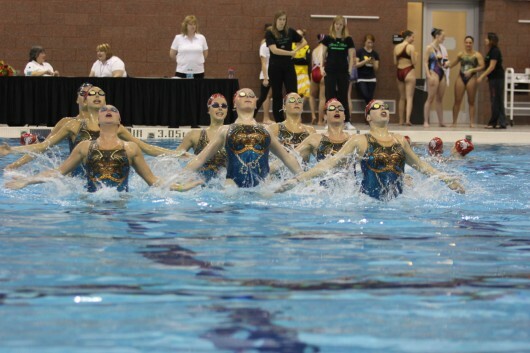 The team, led by coach Holly Vargo-Brown, was awarded three medals at the competition. OSU’s Scarlet Team, consisting of seniors Chelsea Aton and Yuliya Maryanko , juniors Katie Spada and Khadija Zanotto and freshmen Emma Baranski, Elizabeth Davidson, Morgan Boneberg and Lorraine Hack, tallied an overall 85 points to receive the gold medal in the team competition, while the Gray Team, consisting of seniors Lauren Nicholson, Julia and Natalie Gaylard, juniors Samantha Golomb, Heidi Liou and Emily Muma and freshmen Alexa Aton, Jasmine Pulido and Sarah House, was awarded silver with a score of 81.0667 points. The two squads within the varsity team are divided based upon skill, with the athletes more refined in technicality and execution placed on Scarlet. Hack and Maryanko picked up a bronze medal in the duet competition with a score of 164.1038, and the two tied for fourth for the Individual High Point Award with 29 points. Baranski placed fifth in the solo competition, the highest placing for the Buckeyes in that contest, with 81.7333 points. Vargo-Brown said not only was competing in the U.S. Senior National Championships less than three weeks after the U.S. Collegiate Championship challenging, the team also lost senior All-American Lauren Nicholson and freshman Natalie Huibregtse to injury, forcing the teams to make “huge adjustments to each of the free team routines,” she said in an email to The Lantern. However, she said she is proud of the team’s performance. The team’s win follows a second-place finish at both the North Regional Championships March 1 in St. Louis and U.S. Collegiate National Championships in Oxford, Ohio, March 19. Correction: A previous version of this article listed the members of the Scarlet and Gray squads incorrectly. The current version reflects the correct roster.